With such and many more examples, Swami Shivender Nagar, often simply called Nagarji, gives discourses on Bhagvad Gita in India and several other countries. He was born in 1965 in New Delhi. As a young adult, he had the ambition to choose a career in hotel management and settle in Switzerland. Six months into the management course, spiritual inclination directed him to drop the course and join Bible School in Geneva. The studies did not answer all his questions. He returned to Delhi after one year and started seeking a guru. Fate connected Nagarji with Parthasarthiji, founder of the Vedanta Academy in Lonavala, near Pune, India. Nagarji was one of the eight students in the first class at the Academy. The three-year intensive course was taught in Sanskrit and English. He stayed for one extra year learning from Vedanta-related books in Hindi. Parthasarthiji asked Nagarji to go to Delhi and start spreading the message. He started giving weekly classes on teachings of the Gita. Mrs. Rita Puri of Pittsburgh happened to be in the audience in Delhi. She invited Nagarji to come to Pittsburgh in 1995 to give discourses in homes and the Hindu Jain Temple. The yearly trip to Pittsburgh has continued, which resulted in him becoming the teacher at the Hindu Jain Temple Summer Camp. About 100 children and counselors receive training through classroom discussions and interactive games. This is followed by a week-long series of evening lectures on different chapters of the Bhagavad Gita at the Temple. Hard work hardly works. When you enjoy your job it is not work, it is fun. It becomes hard work when you don’t enjoy it. When you demand definite results from your actions, you are pretending to be God. 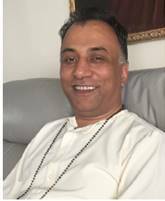 Several families, including Shashi and Ashok Marwaha, in Pittsburgh have hosted Swamiji at their homes. We met him in 1999 in Rishikesh, and have continued our association with him ever since. More people imbibe his messages in their lives. This entry was posted on January 6, 2018, 12:04 pm and is filed under January 2018, Past issues. You can follow any responses to this entry through RSS 2.0. You can skip to the end and leave a response. Pinging is currently not allowed.